Two teams of public servants. Friendly rivalry. Plenty of hot air. And doughnuts. Sgt. Don McClaren, of the Fort Dodge Police Department, gives the other team the “look” during the 2017 Guns & Hoses softball game at Harlan & Hazel Rogers Sports Complex. This year’s game will be played on Sept. 9 at 5:30 p.m. in the same location. 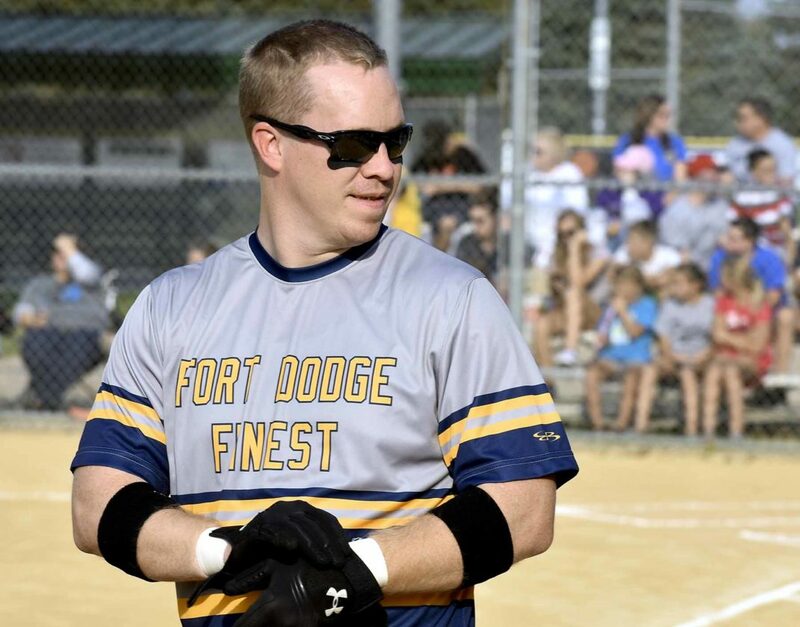 McLaren is the captain of this year’s Fort Dodge Police Department’s team. 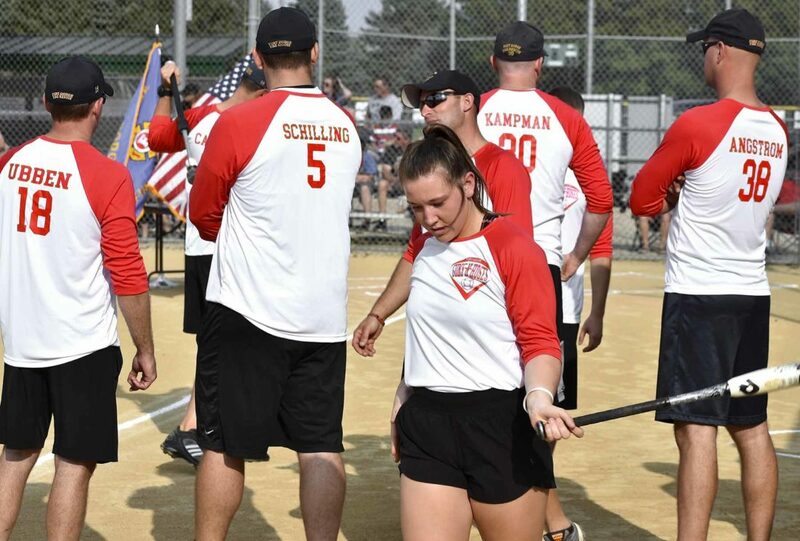 Fort Dodge firefighter Ashley Jochum warms up a bit at last year’s Guns & Hoses softball game in the Harlan and Hazel Rogers Sports Complex. Jochum is one of the team captains for this years game which will be held on Sept. 9 at 5:30 p.m. in the same location. 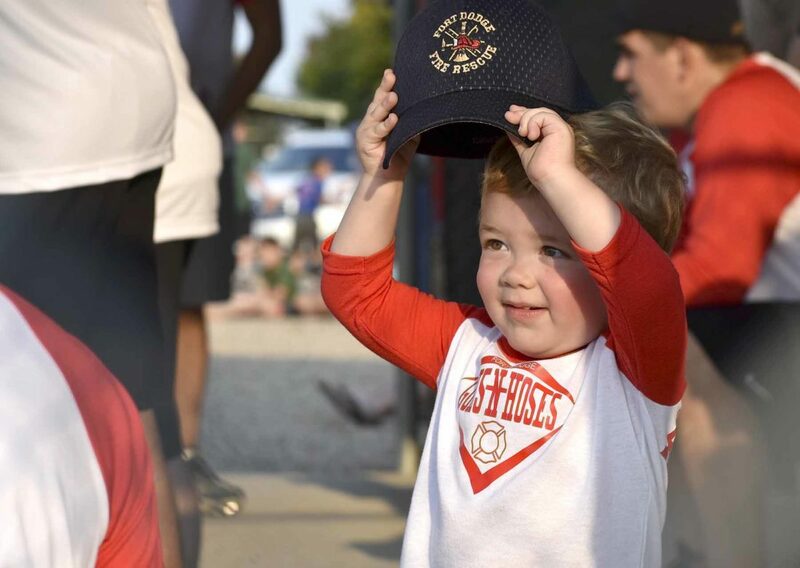 Axtyn Ubben, then 2, of Fort Dodge, tries on his dad’s hat inside the firefighters’ dugout during the 2017 Guns & Hoses softball game at Harlan and Hazel Rogers Sports Complex. He is the son of Tom Ubben and Josie Ubben. The friendly rivalry between the fire services and law enforcement is going back on the diamond Sept. 9 when members of the Fort Dodge Fire Department play members of the Fort Dodge Police Department in the annual Serving Our Servants Guns & Hoses event. It starts at 5:30 p.m. at the Harlan and Hazel Rogers Sports Complex. At stake is a traveling trophy and bragging rights for the next year. Effie Hill, SOS event organizer, would like to see the trophy in the fire station. “They need to polish it up and get it ready,” she said. Hill has a slight bit of a teeny tiny bit of a favorite to win. Hill is married to firefighter Capt. Jeff Hill. The Rev. Al Henderson, founding member of SOS, is hesitant to name a favored team. “I want the fans to have a great time,” he said. Historically, the firefighters haven’t exactly been bringing home the pennant. They’ve lost to the cops the last two years and, during the inaugural event, which was a flag football match, didn’t manage to set the field on fire either. Fort Dodge Police Sgt. Don McLaren is the captain of the law enforcement team. He’s confident enough of a win that should the firefighters pull out of their slump, he promised to deliver the trophy personally to the fire station. Ashley Jochum is co-captain of the fire team. While she maintains that her team is going to win, and win in a rout, the pair almost had to be separated by Henderson and each put into time-out during a lively debate about which service has time to practice. “You’re just jealous of the job,” Jochum shot back. “We’re jealous we can’t take naps at work,” McLaren replied. After Henderson gave Jochum a doughnut and McLaren a pillow things settled down a bit. The 2017 Guns & Hoses event raised about $3,000, Henderson said. The money went to the Domestic/Sexual Assault Outreach Center in two separate donations. The turnout for the event last year was about 300 people, Henderson said. He’s hoping to see 500 this year. 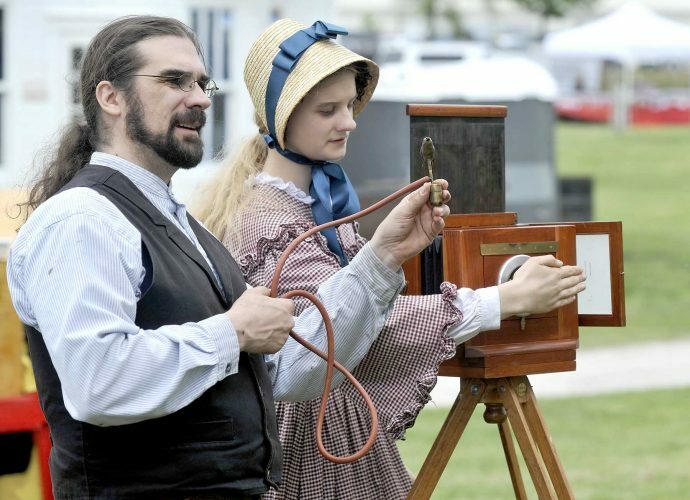 He stressed that the game is a fun, family-friendly event that’s not just for law enforcement, firefighters and their families. “This is for the whole community,” he said. Those who go to the game will have the option of buying Guns & Hoses shirts in one of three colors. Full concessions will be available as well. There is no admission fee, but SOS asks each person who attends to make a freewill donation. The tossing of doughnuts onto the field will not be allowed. “You can throw pillows and blankets to take naps, though,” McLaren said. Henderson will not be asking for any particular winner during prayers. “I’m praying for good weather and good sportsmanship,” he said. “And for the PD to win,” McLaren said. Henderson looked at him over the top of his glasses and shook his head no. In addition to support from the community, the event has also gained sponsorships from Fort Dodge Ford/Toyota, Kemna Auto and Shimkat Motor Co.